Precast Concrete Data and Outlook (Market Research 2008-2022) was released in the third week of January 2018 featuring independent research, comprehensive data, analysis and reviews, as well as market growth trends and market share of precast concrete companies in Indonesia. The discussion is done in detail from the growth trend of the market market of precast concrete market (market value) and volume (market size), top 5 producer profile, market share, upgrading trend, up to the main catalyst analysis of growth drivers in long span of time . 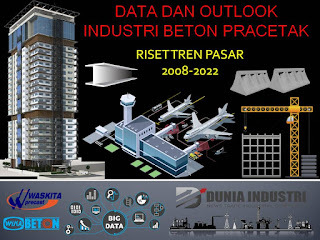 Precast Concrete Data and Outlook (Research on Market Trends 2008-2022) begins with exposure to Indonesia’s macroeconomic data, inflation, and rupiah exchange rate (page 2-4). Followed by an analysis of the acceleration of infrastructure projects that became one of the main catalysts driving the needs of precast concrete (pages 5-11), including graphics and tables of toll road development plans 2015-2019. On pages 12-14, the Duniaindustri.com team made an independent review of the growth trend and projected precast concrete market for the 2008-2022 period. The methods used include the analysis of the sensitivity of infrastructure budget acceleration to the needs of precast concrete, exponential projections, and linear projection. With a fairly comprehensive method, the market value and market size of precast concrete industry in 2008 to 2020 on page 15 to page 17. From the data presented in the table of interest can be seen the percentage of growth in that period. The data is also reinforced by the growth trend of two market leaders who become benchmarking (pages 18-19), thus providing a more real picture. The discussion continued with the national precast concrete industry profile on page 20. And the profile of the five market leaders of the precast concrete industry are presented specifically on pages 21-25, including capacity expansion trends, growth percentages, plant location, financial performance, and company’s flagship products. Continuing to the next discussion, on page 26 to page 31 is displayed in the graphics and growth charts of the market share market leader of precast concrete industry based on capacity and on the basis of sales. On page 26-30, the market share of precast concrete market leader based on production capacity in the period 2014-2017. While on page 31, the market share of precast concrete market leader is based on the sales value of 2016. The general definition of precast concrete and the composition of the raw material of production is shown on pages 32-35. The goal is to provide a deeper insight into the production of precast concrete to the type of additives commonly used. On pages 36 to 79 pages are presented market intelligence materials from the performance of all aspects of the two market leaders in the precast concrete industry. The discussions in this section are conducted in a specific and in-depth manner covering the location of the plant and its capacity, sales composition, production trends per plant for the period 2013-2016, contract movement obtained in terms of value and period, superior products, top 10 buyers, real money.